We have gained much technical knowledge and expertise in the manufacturing, exporting and supplying of Programmable Logic Controller, which are reputed for their exclusive designs and superior quality finish. 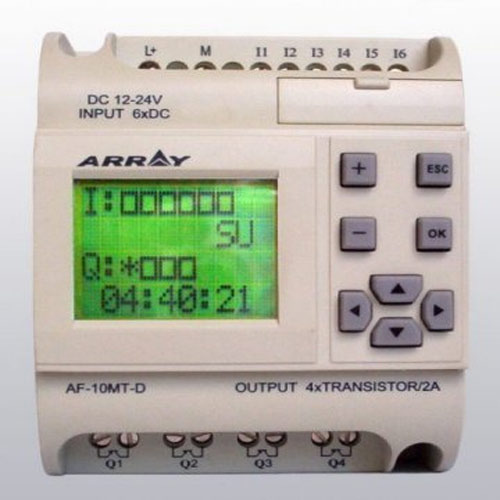 A programmable logic controller or programmable controller is a digital computer used for automation of electromechanical processes, such as control of machinery on factory assembly lines, amusement rides, or light fixtures. PLCs are used in many industries and machines. Unlike general-purpose computers, the PLC is designed for Programs to control machine operation are typically stored in battery-backed or non-volatile memory. A PLC is an example of a hard real-time system since output results must be produced in response to input conditions within a bounded time, otherwise, the unintended operation will result. With our long presence in the industry and established in the year 2006, we "Soft Logic Controls" have been able to acquire a remarkable position as one of the top ranking, Traders, and Service Provider of a Plethora of Factory Automation & Electronic Components and Spares. Also, we are instrumental in rendering value-added installation services, after sales service and online support to our esteemed clients. Our range of qualitative and reliable electronic products includes like PLC, AC Drives/VFD, AC Servo Motors and Amplifier, HMI/MMI, SCADA Systems, Encoder, SMPS, Sensors etc AC Drives, Electronic Components, Sensors, Servo Amplifiers, Servo Motors and SMPS. Standing on the pillar of customer satisfaction and quality, we offer our wide assortment of electronic products, which caters to various industries and other application areas. Further, we are empowered with a sophisticated manufacturing facility comprising advanced technological tools and equipment for designing and assembling various electronic components. Driven by a passion to excel in all our business endeavors, we have set various benchmarks of attaining greater heights of quality and customer satisfaction. We are acclaimed worldwide by our clients on our on-time delivery of products coupled with the top-notch quality of services offered. Further, we ensure our entire product range to be on par with international quality standards.